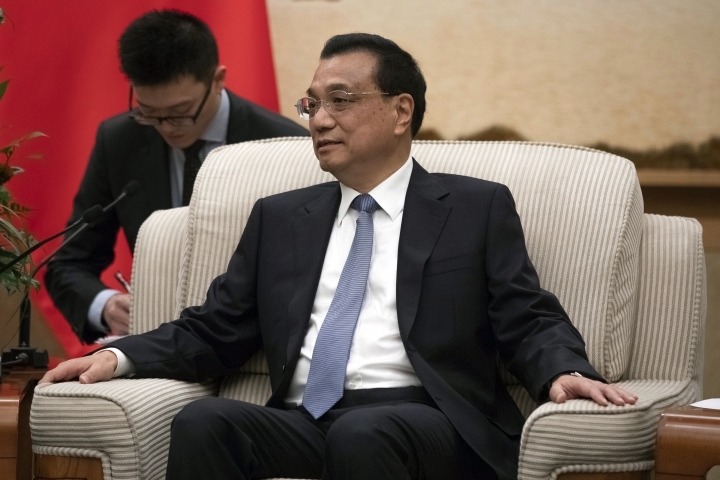 BEIJING — It's taken nearly seven years, but a Japanese leader is finally returning to China on an official visit for bilateral talks. Prime Minister Shinzo Abe arrived in Beijing on Thursday as both countries try to repair ties that have been riven by disputes over territory, military expansion in the Pacific and World War II history. 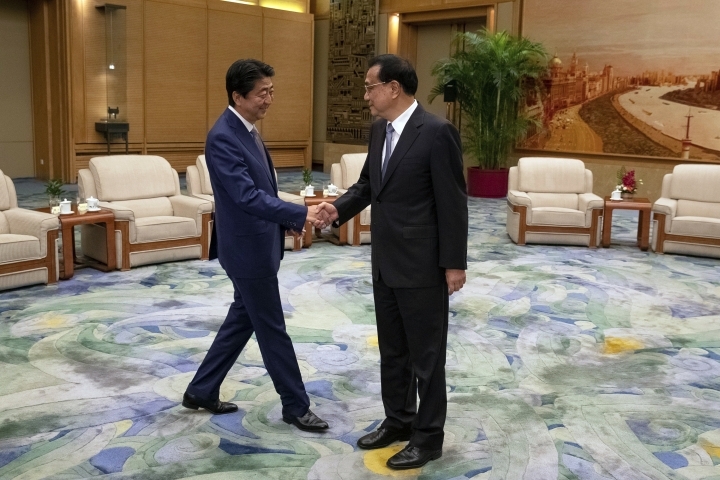 Abe met with Chinese Premier Li Keqiang ahead of a Friday summit with China's top leader, President Xi Jinping. He is scheduled to return to Japan on Saturday. The last such visit was in late 2011. 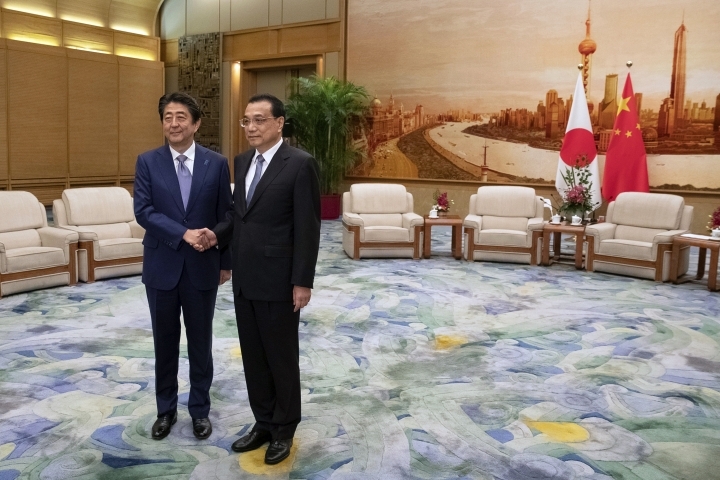 "We hope the two sides will work together and make efforts to maintain the stable and healthy development of China-Japan relations, and to make new progress," Li told Abe. 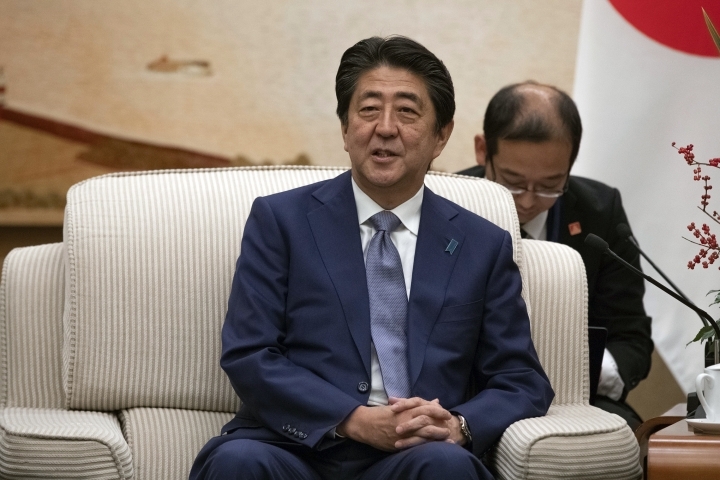 A delegation of Japanese business leaders is accompanying Abe as Asia's two largest economies seek to deepen trade, investment and cooperation on infrastructure and other projects in third countries. China is Japan's largest trade partner. Abe said he would stress the importance of strengthening a free and fair trading system. Japan shares U.S. concerns about Chinese trade practices, but favors dialogue with Beijing over President Donald Trump's tariff strategy. Japan has been targeted by U.S. tariffs too, though much less so than China. The last Japanese prime minister to make a bilateral visit to China was Yoshihiko Noda in December 2011. High-level exchanges were frozen in 2012 after Japan nationalized a small group of remote islands in the East China Sea claimed by Beijing. That set off violent protests in China and sent Japanese investment in China and tourism into a nosedive. Chinese coast guard vessels continue to make regular incursions into Japanese waters around the islands. The territorial dispute is in part a reflection of growing tension in the Pacific as an expanding Chinese navy sails into waters long dominated by the U.S. Navy. Japan is a major U.S. ally and hosts a major American naval base. 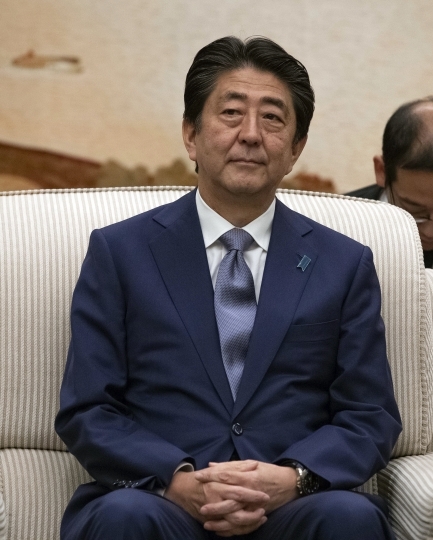 Abe has steadily raised defense spending since taking office in late 2012 in the face of growing concern about potential threats from both China and North Korea. 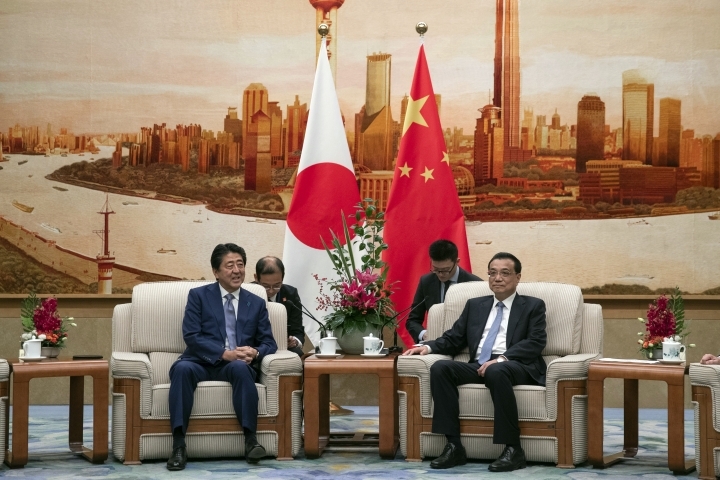 Abe visited China in 2016 to attend the Asia-Pacific Economic Cooperation summit in Beijing, but this week's visit is the first bilateral one by a Japanese prime minister since Noda's. A recent improvement in relations was marked by a visit to Japan in May by Li, the ruling Communist Party's second-ranking official. Xi is expected to visit Japan next year. 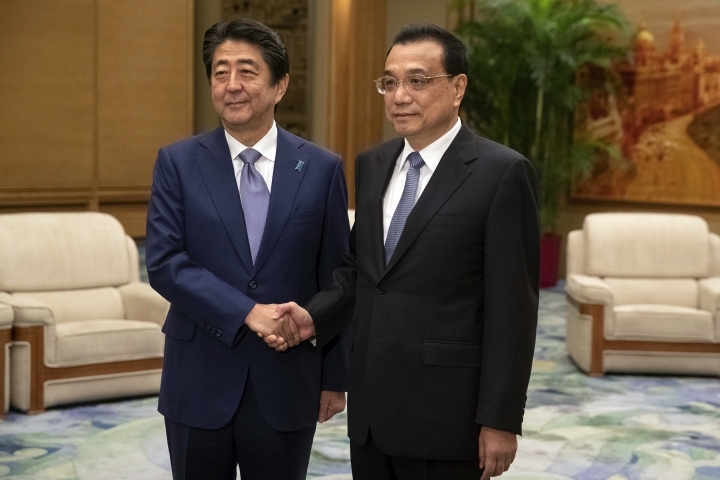 "I'd like to share with you the joy of this memorable year in which we were able to realize the visit of both leaders to the country of the other," Abe told Li during their meeting. 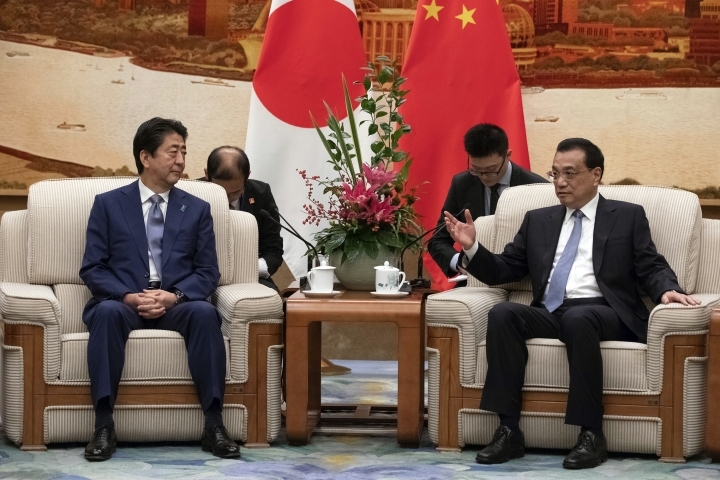 Ties have improved to the point that during Li's visit the sides agreed to establish a defense hotline aimed at preventing military clashes stemming from their row over the uninhabited East China Sea islands — called Senkaku by Japan and Diaoyu by China. And despite China's continuing dispatch of ships and planes to Japanese-controlled areas, the two nation's militaries are working on further cooperation, according to Chinese Defense Ministry spokesman Col. Wu Qian. "In recent years, we have made some progress in defense exchanges between China and Japan," Wu said at a Thursday briefing, referring to junior officer exchanges and a visit to Japan by a delegation from China's National Defense University. "We would like to properly handle differences and make contributions to the overall relationship and regional peace and stability," Wu said.